In the cost-conscious world of modern business, there are many good reasons to use an executive recruiter in Milwaukee when you are hiring for top positions. While most companies have very efficient human resources departments that handle most normal hires, finding the best executive or top manager can require special expertise that executive recruiting firms such as the Lawler Group offer. Most companies who deal with specific goods and services are well-versed in hiring production workers, office personnel, and most levels of administrators. With a savvy HR staff in place, they often have a good handle on the local marketplace and have a contact list of employment agencies who might assist them on occasions. When they need managers and department heads, they often find that promoting from within is an excellent way to keep good employees. However, when they are looking for a president, CEO, or other corporate level executive, even a good HR department can quickly be out of its element. When companies hire people, they typically post a job opening and wait for responses. In the absence of extremely well-qualified candidates, they may settle for someone who has less training, education, or experience than they want due to the market. For a highly-paid executive, however, settling for a less than adequate candidate is usually a poor choice. Executive recruiting firms approach job placement differently. While they work with some candidates who have come to them in search of the position, their main activity is actively searching for candidates among those who have extraordinary qualifications yet might not be looking for a new position. 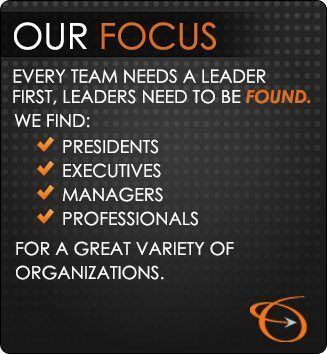 They seek out the right candidate, beyond those who present themselves and are available. A typical recruiter’s day is spent calling and emailing numerous potential matches for current searches. An average internal HR professional usually has many priorities in addition to searching endlessly for the perfect candidate to fill any given job. They are simply unable to devote the resources to tracking down that special someone who may be out there somewhere in the field. Even if it is a top priority in the company to fill a certain position, there are usually parameters in place to contain the cost. Finding the right candidate can be an expensive venture, as there are often multiple interviews involved where the company pays the travel expenses. Introducing the candidate to those involved in the day-to-day operations of the company as well as to the Board of Directors is also time-consuming and costly. Working with a recruiting firm has costs associated with it, of course, but such firms have an excellent handle on the pool of available talent for certain job titles. Those who do the job are experts at evaluating potential hires, not just based on the resume the applicant offers, but from all types of information at their disposal. They often have insights about candidates that those within the company are not trained to pick up. As a result of using an executive recruiter, a company can spend less to find a candidate who proves to be a much better match than what they can find on their own. The person they bring forward for final hiring will not only have the credentials but also the personality and work ethic that will fit in perfectly at the onset and over the long haul. When you are ready to hire for a top position, enlist the services of an executive recruiter in Milwaukee at the Lawler Group. For information on how we can supplement the services of your internal HR team, contact us today.